How much do you know yourself? When you think of who you are, how does it make you feel? Proud? Happy? Not so much? What are other people's perceptions of you and how do you want to be perceived?We all need to search ourselves for our purpose-not just success, wealth or degrees, but to find our true selves and where we are best fitted. Many people live their lives with uncertainty. They walk throu… gh life blindfolded, chasing ghosts. Only when you discover and understand who you really are, will you know if you havesurrounded yourself with the right people. 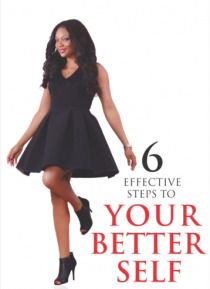 This book is about regaining your self-worth and sense of purpose. It is divided into six steps that focus on topics important to your mental and emotional wellbeing and development. They are guidelines that will help you reinvent yourself to be your better self. Once there is life and good health, the most important thing ishappiness. Though everyone's definition of happiness may differ, in the end we all are in the pursuit of happiness. Happiness first begins from finding your better self.